The technical picture for spot silver is very similiar to that of spot gold at present, with both commodities staging a small rally yesterday after the steep falls of Tuesday and Wednesday. 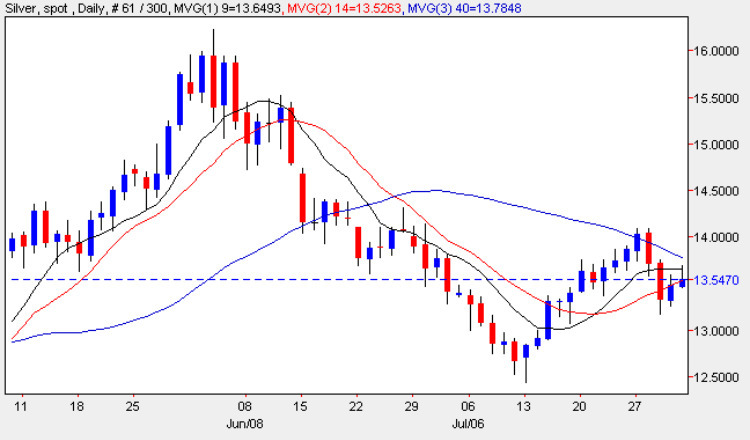 For silver, the high of the day failed to penetrate the 9 day moving average, and closed marginally below the 14 day moving average as a result, suggesting that this may be offering a degree of resistance to any further move higher. Indeed with the bearish engulfing candle now firmly in place, and with a strong and deep level of congestion immediately ahead, this seems unlikely at present, as any reversal back higher for the price of silver will require a sustained effort in order to break through. Given that we are now approaching the weekend with many traders squaring their positions, and coupled with a relatively thin day for fundamental news on the economic calendar, any sustained break higher is not likely to occur. The key, of course, to the depth of the current down move will be the technical support levels and whether they are able to provide the required platform to prevent any deeper falls. The first of these minor levels it as the $13.25 price level, followed by the more significant area of price congestion in the $12.55 region – and should this fail then we could see a much deeper move to re-test support at the $11.90 level and below. Should any of these moves be accompanied with pressure from the three moving averages then this will simply add momentum and velocity to any fall.